& cold & at a weird place when he’s usually in his safe small car bed. a synonym for someone’s bless you. Anastacia-Reneé is the current Civic Poet of Seattle. 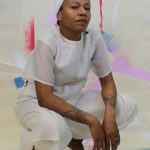 She has received writing fellowships from Cave Canem, Hedgebrook, VONA, Artist Trust and Jack Straw, as well as a writing residency from Ragdale. Anastacia-Renee is the Author of five books: Forget It (Black Radish Books), (v.), (Gramma Press) 26, (Dancing Girl Press), Kiss Me Doll Face (Gramma Press) and Answer(Me) (Winged City Chapbooks, Argus Press).